This patent pill formula is sold in two sizes—choose from—one bottle of 60 pills (that’s a 5-day supply) for $12.99, and we discount on a 60-day supply (12-bottles) for $150.99 ($12.99 + $138.00). 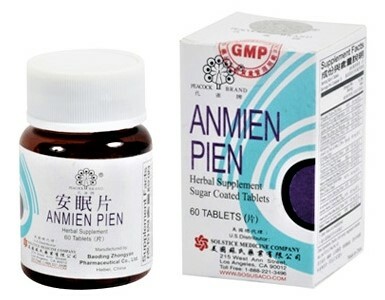 An Mien Pien is a powerful combination of gardenia, polygala, poria, glycyrrhiza and zizyphus, used to provide natural relief from stress, anxiety, nervous tension, restlessness, and depression. It will calm the spirit and tranquilize the mind, relieve mental exhaustion, and insomnia, without contraindications or side-effects like drowsiness! How often should I use it? It all depends on your need, the An Mein formula is easy to use and effective, it is not a sedative nor is it habit forming, you can take it throughout the day and remain alert and be able to relax yet function without sluggishness, and it has no negative effects! Long-term use is recommended for the best results.